The Saturday day before my 20 km race, the four of us (I, Ruth, our two daughters) drove north and east "up" the A9 to Nîmes to do a bit of sight-seeing. Nîmes is less than an hour from Montpellier and has several well-preserved monuments from its Gallo-Roman past. I visited in 2012 and have been pitching the idea of another visit to my family for months. Part of my pitch was this episode of "C'est pas sorcier": Pont du Gard et Arènes de Nîmes : L'architecture gallo-romaine. I wish we'd known about "C'est pas sorcier" before we arrived. France 3 has uploaded all of its 550+ episodes to Youtube and they'll be a great resource for us when we get back to Colorado. English Wikipedia translates the title as "It's not rocket science," but "It's not magic" is better in the context of the show, which features technical models and scientific explanations. There are 42 kilometers on the A9 autoroute between Montpellier Est and Nîmes Ouest. It's 3 lanes in either direction with one toll plaza on the A9 east of Montpellier and one at the Nîmes exit. We picked up a ticket leaving Montpellier and paid €7 (if I recall) when entering Nîmes. Freeway driving in the South of France is pretty much like driving in the US. The maximum posted speed limit is a bit higher than in Colorado, but we don't see many drivers exceeding it like they do on the Front Range. I've read that photo radar and steep fines have been implemented to curtail speeding on the autoroute. French drivers are less erratic than Colorado drivers and I feel like we're somewhat safer on the A9 than we are on I-25. On this trip, as on the others during our séjour, we're driving a 2005 Opel Meriva. It's turning out to be an adequate car. It seats 5, handles fairly well, and gets great mileage. When it was new, its engine generated 85 hp, about a third of our Honda Odyssey's output. We're one of the slower cars on the autoroute, holding down the right lane with the Citroën C3s and the Renault Clios. Nimes is the capital of the Gard (number 30, alphabetically, of France's 96 départements) department, as Montpellier is for the Hérault (34). The Nîmes metro is 250,000 people, about the size of Fort Collins, Loveland, and satellite towns. Nîmes is further from the shore, more in the hills, than Montpellier. Outside the historic center of Nîmes are orchards, suburban sprawl, and struggling zones à urbaniser en priorité (ZUP). On Avenue Kennedy we passed between Valdegour and Pissevin, largely immigrant neighborhoods where unemployment approaches 45% and services and shops have withdrawn. It's a bad situation poised to become worse; a rightward-moving France doesn't seem likely to undo the racial and ethnic segregation in smaller cities like Nîmes and Montpellier. 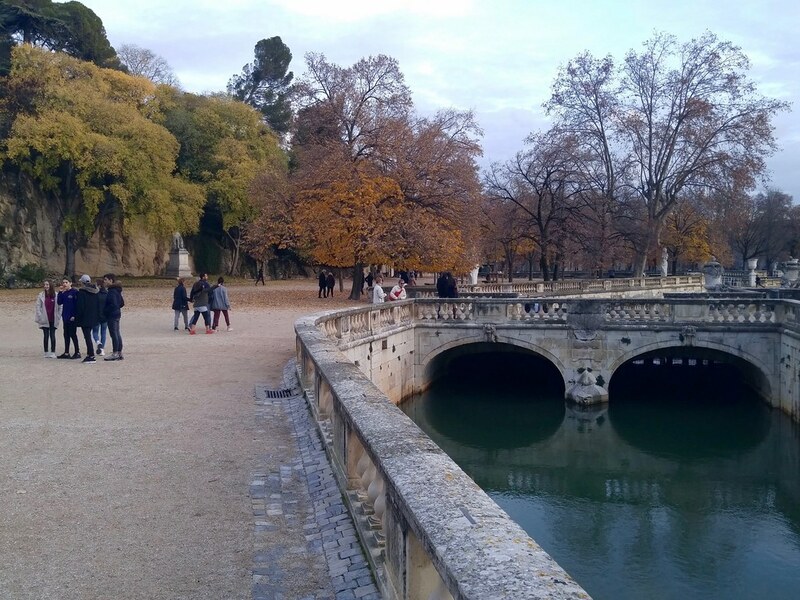 We parked our car in a large pay lot (seasonal music included) near the Jardins de la Fontaine and walked to the center from there. 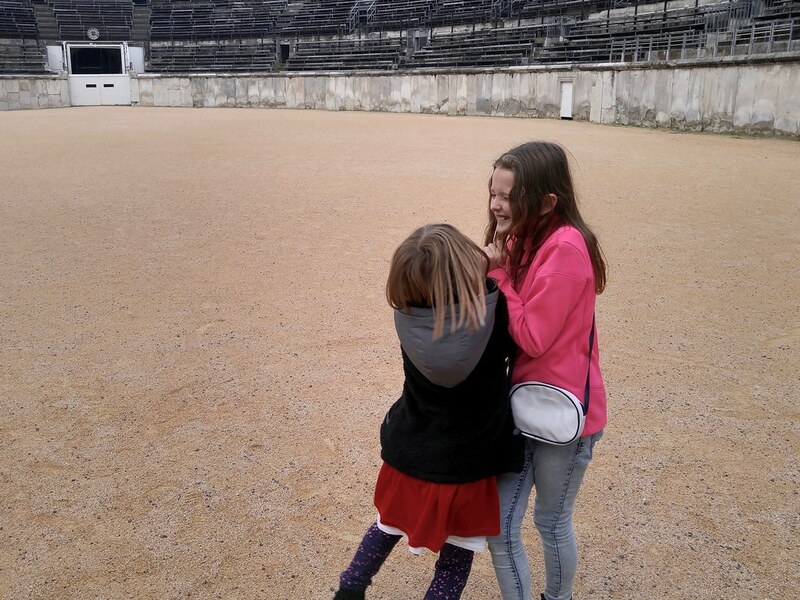 Our first stop was for fast food, pasta in cartons for the kids, on one of the pedestrian shopping streets, fully decorated for Christmas, and then we went directly to the Arènes de Nîmes, the Roman amphitheatre. At lunchtime on the last Saturday in November there is no waiting in line to get in like there is in summer. 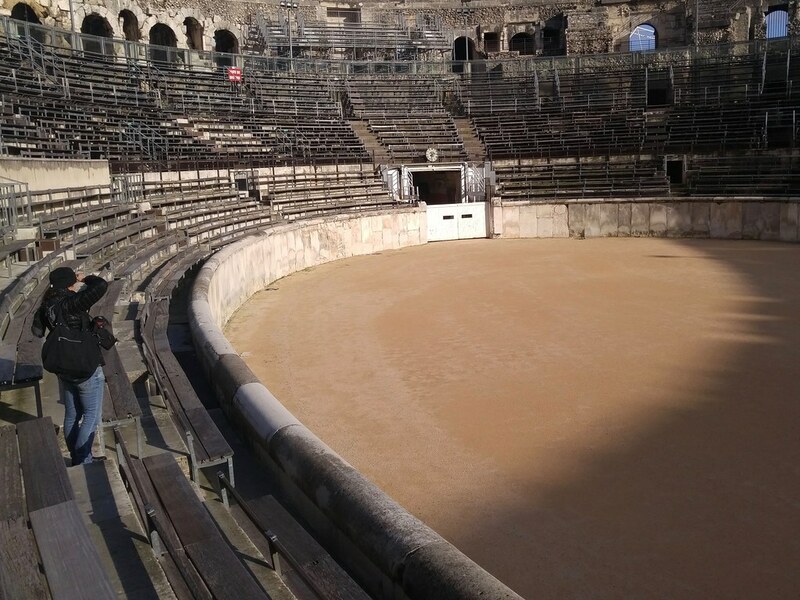 On my one previous visit to Nimes, I lost my wallet in Montpellier's train station (whether by pickpocket or absent mindedness, I'll never know) and had only my return ticket and the change in my pocket, nowhere near the price of admission to the amphitheatre. This then was my first time inside and I was very impressed. Constructed around AD 70, it seats almost 17,000 and is still used today for corrida (bullfighting) and music festivals. The sandy piste of the arena, was as they say in France, exceptionally open on the day of our visit. The Maison Carrée was once a temple on the forum of Gallo-Roman Nemausus (as Nîmes was called). It still stands 2014 years later and has been recently restored. There's a small movie theater inside that shows a short historical drama set in the century before the completion of the amphitheatre. It was a little hokey, but our kids enjoyed it and got a sense of what joining the Roman Empire meant for the tribe of Gauls settled around Nemausus: security, international trade, and measurable prosperity. Our final, and favorite, stop was at the Jardins de la Fontaine, a spacious park established at a spring and Roman nymphaeum. Almost 4.5 kilometers of passages and galleries have been found in the karstic network upstream of the spring by spéléologues (spelunkers) since the 1950s. From the terraces and fountains, footpaths and stairs zig and zag up the hill to the Tour Magne on top. It was too late to get into the tour, but we had a great view of the sunset from its base. We all agreed that the park alone was worth the drive. There's a lot to see and do there, including terrains de pétanque (boules), a manège (carrousel), and pony rides.